Hoppin’ Frog – The Barley Whine bourbon barrel aged Imperial Pumpkin Ale at 10.5% ABV, a West Coast interpretation, the Autumn Maple at 10% ABV, yam based brew with pumpkin spices, molasses, vanilla and Belgian yeast from The Bruery, and from Hoppin Frog, Frog’s Hollow Double Pumpkin Ale at 8.4% ABV. 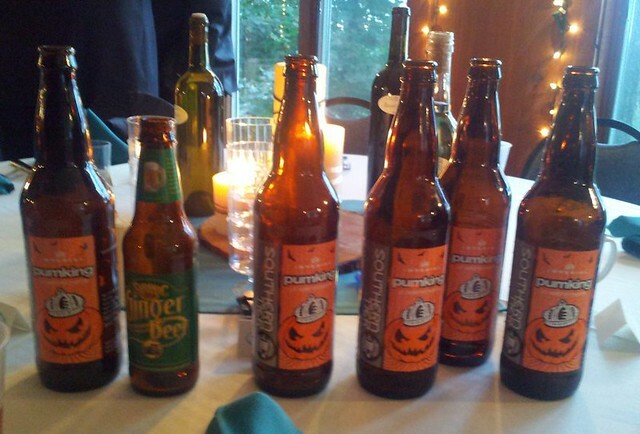 Also included was a favorite from New York, the Southern Tier Pumking, another imperial at 8.6% ABV. Akron’s 7th Annual Blues and Brews event at Lock 3 was held on a glorious August Saturday in the downtown of the Rubber City. Big thanks go out to Don and company at The Art of the Brew (and random.org) for tossing us the free tickets and Christine Montague for all the great info. These events can be burdensome on the beer lover, and credit should also be given to everyone organizing this event. 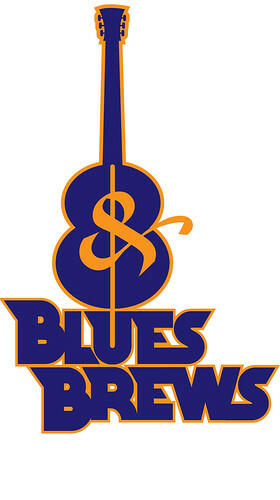 Blues n Brews succeeded as a living clockworks of pouring volunteers and guzzling geeks, to near perfect efficiency. 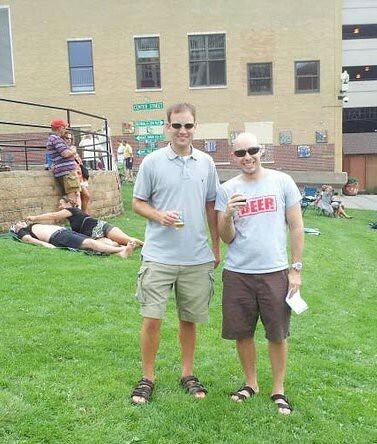 None of the lines (a la Brewzilla) appeared. Not only was it smartly designed but the planning brought in a boatload of local brewers and local food. Two dozen Ohio breweries were represented, surprising nearly everyone with the variety and quality of their output, and the music and Winking Lizard food were icing on the pint glass. 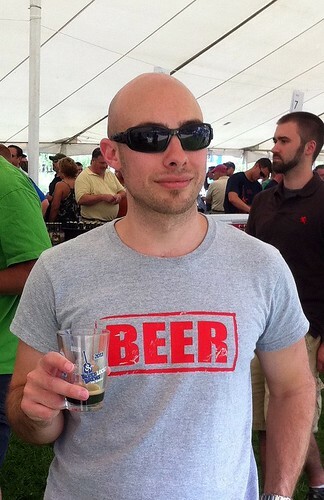 If you have never been to a beer festival the structure generally conforms to a template of 1. Sell two types of tickets, standard and a premium known as Brewer’s Circle 2. Have food and– especially for outdoor events– water readily available 3. Provide a small sampling glass and tickets for beer sampling. Blues n Brews stuck to this template, allowing the Brewer’s Circle folks in two hours early and giving them access to a list of limited release barrel aged beers. We went this route, and while a few stations took a bit to cool kegs and get tapping, had an inspiring Hop Jam from Willoughby Brewing moments after getting in: and it only picked up from there. Hoppin’ Frog – D.O.R.I.S the Destroyer Double Oatmeal Russian Imperial Stout: A thick bodied, soy-sauce free chocolate/espresso flavor bomb. Willoughby Brewing Co. – Hop Jam Black Rye IPA: Less than two weeks old, the hops are hugely piney and spicy with great malts to balance. The Elevator – Big Vic Imperial Mogabi: A HUGELY citrus and fruity wheat IPA. Had after some big beers this beer held up to the biggest and baddest; reminding us that Columbus has a lot to offer. Weasel Boys – Bourbon Barrel Aged Anastasia Russian Imperial Stout: Zanesville, are you kidding me? Do they drink bourbon there? Who cares; this beer had sweetness, mocha roasted stout flavors, and reminded one of us of a certain rare B.O.R.I.S variety. Good show guys. Jackie O’s – Hogwash: The Athens Ohio brewer known for creativity takes his shot at breakfast sausage. A spicy brew with massive lavender, backed up with a smokiness. Very different, and very drinkable. Cellar Rat’s – Ratzberry Plague Porter: Nothing like plague rats to make one questions the potability of the beverage being poured by a volunteer from a poorly marked firkin. Medieval pandemics aside, a fruit beer with even a pleasant name stands a thin chance of winning over sods awash in barrel ages stouts. But yet the Ratzberry Plague Porter holds its own as creamy porter with a succulent red fruit element that screams sessionable. Thirsty Dog – Bourbon Barrel Aged 12 Dogs of Christmas: Lots of nutmeg and cinnamon spicyness, malty sweet, with vanilla and oak from the bourbon. The added complexity makes a pretty good beer that much nummier. 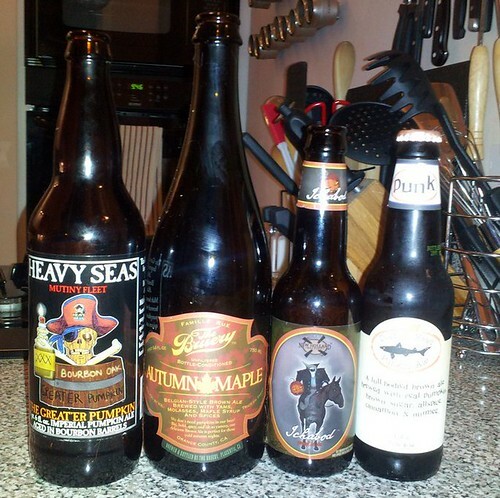 We also sampled other tasty beers, all of which ranked, at worst as “not bad”. There were still scores of beers more we would have loved to sample; it seemed the rows of appetizing craft beer went on for miles. 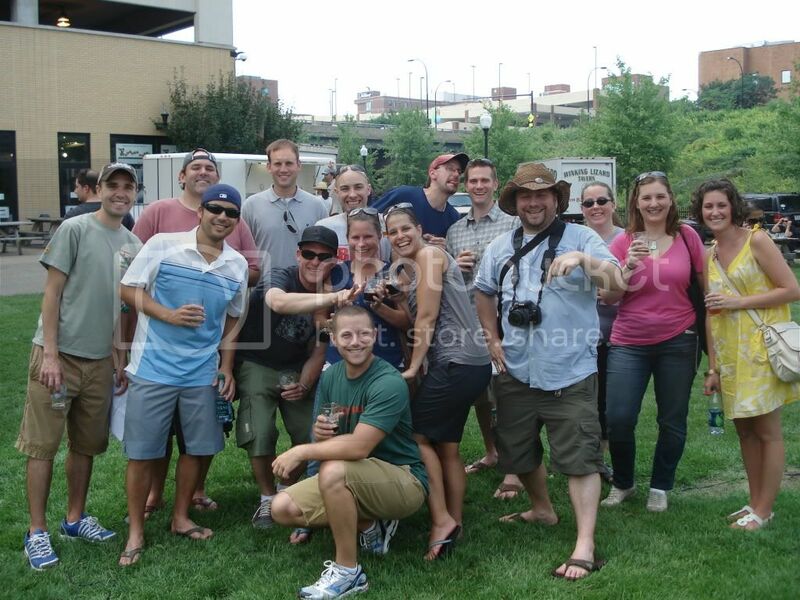 Perfect weather, great food, and lovely people made for an awesome craft beer happening. If you love good beer and live within a few hours drive, make it here next year to this great event. [dropcap]A[/dropcap]s the warmer months are upon us, palettes turn to lighter, more thirst quenching fare. But are we cursed to guzzle Coronas, super sweet dressed up wine coolers from a can, or “Light” beers? In the “What to drink this summer” series we will offer some alternatives to the usual, and sun-poison your taste buds with options. The beer style with the most buzz right now just might be shandy. Not really a style at all but a mix of lager and a citrus or ginger flavored soda, the combination is popular in nearly all markets that drink beer. In the U.S. beer has mostly kept away from the Mike’s Hard Lemonades. But as the beer market continues to grow, diversify and mature drinkers are more willing to try hybrids once thought unsaleable. And in summer even the most hoity beer snob is more willing to try something farther up the refreshing scale. Leinenkugel’s Summer Shandy is popping up everywhere and at 4.5%ABV it will turn a few Landshark/Smirnoff Ice types on to something new. On the more extreme side is Turbo Shandy, a flavorful, higher gravity blend. If shandy is the craft beer take on Mike’s Hard Lemonade, Turbo Shandy is the answer to the Mike’s Harder series. 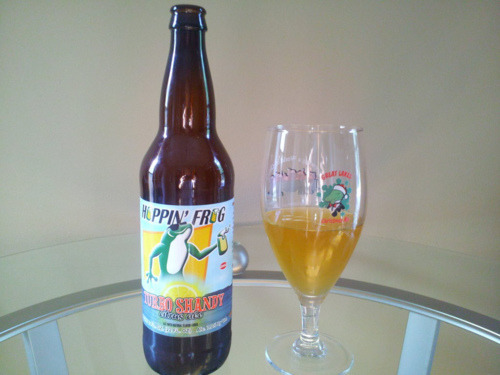 One readily available take on this style is Akron brewer Hoppin’ Frog’s Turbo Shandy Citrus Ale, a 7.0%ABV 7.3IBU offering. Turbo pours blonde with a limited white head and bubbles away quickly. With a clean lemon fruit (not furniture polish) scent there is no hint of either beer or booze. The taste is a mildly sweet lemonade up front with some good carbonation. The finish has some malty complexity that hints of the grains in the brew. There is no hint this stuff is 7%. Very drinkable. This was our first commercially produced shandy, and we were was not certain what to expect. Luckily, this stuff brewed right. Never too sweet and with just enough beer flavor to keep your beer-geek credentials intact, this is a creative option for the warmer months. The appeal is nearly universal, and the quality is high. Our only criticism might be that the beer flavor was perhaps not pronounced enough. As these cocktails are traditionally blended with a pilsner, that may be too much to ask.